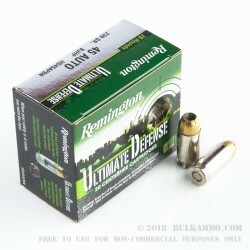 Remington’s Ultimate Defense line of full-size handgun ammunition is designed to always be trusted when it is most needed. 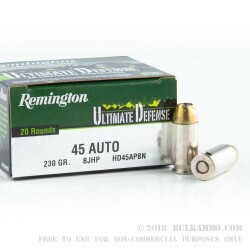 This 45 ACP cartridge features a relatively heavy 230 grain Golden Saber brass jacketed hollow point bullet. Because brass is a harder metal than copper, this bullet’s jacket will produce less fouling in the barrel and hold its contents together better at higher velocities. The bullet’s hollow point is designed to deliver massive knockdown power, facilitated by its jacket’s superior penetrating power as well as the jacket’s fault lines that neatly control expansion. 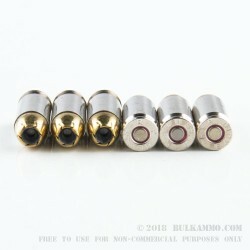 This water resistant cartridge additionally offers powder treated to reduce muzzle flash as well as a fully-reloadable brass casing with nickel plating to facilitate feeding and ejection. With its muzzle velocity of 875 fps, this reliable and powerful cartridge by Remington is a great instance of the old American manufacturer’s commitment to delivering results to their customers.